Hawthorn Hill is a striking development of 61 luxury one and two bedroom apartments set within the context of a refurbished heritage building. Grollo Group, the building includes a grand historic entrance lobby, classic styling, meticulous interiors and uninterrupted city views. The sensitive use of contrasts, colours and materials provide a pleasing integration of style between the new and old buildings. Each of the apartments at Hawthorn Hill has been designed to accommodate a collection of furniture and a series of pieces, rather than conventional built-in items. This is applied across kitchen, living, bedrooms and bathrooms. 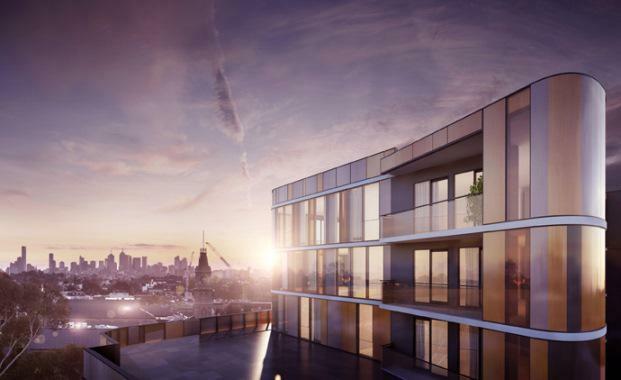 “The intention is to produce an elegant development that celebrates and enhances the original buildings, while delivering landmark Hawthorn residences for the ages,” development manager Nicholas Wilkinson from Grollo Group said. Equiset Grollo Group is a privately owned Melbourne based property development and construction company, backed by their parent company, Grollo Group. The Grollo family has been involved in the development some of Melbourne’s most recognised buildings, including the iconic Rialto Towers on Collins Street. The project is being marketed through 360° Property Group.